I was lucky enough to be a part of a fun birthday surprise for Samantha. Michele had told Samantha that they were coming to Utah for a week when in fact they were heading to Orlando to Universal Studios. I was lucky enough to tag along. She didn't know until she got to Orlando and I snuck up behind her that I was coming. It was such a fun surprise! I wish I would have recorded her face. We flew in on Valentine's day. We stayed at a gorgeous hotel connected to Universal. We took a water taxi everywhere. That night we decided to go explore the city walk. Since it was a Saturday night and Valentine's you could imagine the wait times we encountered. We finally found a reasonable wait at NBA City. Ha! The next day we went to Universal's Islands of Adventure. I was so excited to be back at the Wizarding World of Harry Potter. I hadn't been there since Diagon Ally had opened. First things first though, we had to have Butterbeer....and lots of it! Samantha and I listed to her favorite group right now '2 Cellos.' They are very good. We listened to the frog choir. The next day I woke up and enjoyed this. They sun was amazing. We stood in line a few minutes to talk to the driver of the night bus. It's weird to me that I have been a parent for a decade. There is no way that I can have a ten year old! It's true though. I love her so much! Shelby is a wild, loving, fierce, strong, independent girl. She knows what she wants...or what she doesn't want and fights for either one. She got to open her presents from us on her birthday morning. She got a kindle fire that she was very excited about! I made this collage to show how much my baby girl has changed! Doesn't she look so grown up and cute! Some of her non-favorites are Kumon, homework, chores, canned corn, coconut, loud noises and scraping utensils on plates. 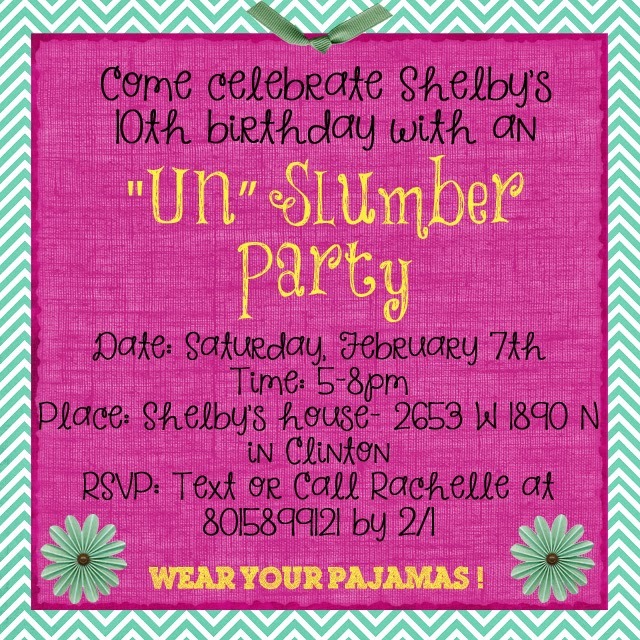 Shelby was turning ten and wanted to have a friend birthday party so I said I would plan her one. I gave her a bunch of options and she wanted a sleepover type party. As we were out and about running errands on the day of the party, Shelby told me that she had been seeing black floaters in her eye since she had gotten hit at school the day before. It was very troublesome for me because that is something that her eye doctor had specifically told us to watch for with her. It is a sign of retinal detachment. I called the on-call ophthalmologist at the Moran Eye Center and they wanted us to come right in. Now, I obviously would do whatever it takes to protect her vision, but I wanted to know how urgent it was to have her seen. Shelby really wanted to have her party. We headed to my brother-in-laws' so he could give Shelby a blessing and then I went to a local optometrist. He couldn't give us a good answer as her eye situation is so complex but he did think that it was okay to have her party and then head down to the Moran Eye Center after the party. We had LOTS of yummy breakfast food. I had Tucker build tent frames as I wanted a campout feel to the party. He did an excellent job. Shelby had a bunch of her school friends over and her 2 cousins that are her age. 12 girls in all! All of the girls LOVED the "campfire" and the tents. Shelby loved opening her presents...She probably got 80% cat stuff. HA! We also played some fun games, told some ghost stories around the campfire and painted nails. I found this cool candle that unfolds when you light it and plays the Happy Birthday song. The party was a huge success! I loved watching Shelby with her friends. After the party, we headed down to the Moran Eye Center. We got there around 9:30pm. They are fantastic there. They did a very thorough examination and found that her vitreous is torn. They were specifically looking for tears in her retina but the doctor said that it can be like trying to find a needle in a haystack. Her doctor said to make sure she does not do any contact activities anymore...ever. The future of her eyesight worries me but this girl has had many miracles happen to her and hopefully will continue her life with full vision! I enjoyed my month long break off of school but on January 12th it was back to the grind. I am a senior now! This semester is probably my hardest one yet. I am taking 5 classes: human behavior and the social environment II, theories of personality, child psychology, social work policy and social work research. That consumes most of my life right now, especially since I have to go to class every day. Chloe goes to Weber with me on Wednesdays and Fridays. She loves the daycare up there. Basketball has been the other thing that has kept us busy in January. Chloe made the cutest friend named Axel at Keaton's games and played with her every game. This was Keaton and Shelby's first year playing. Keaton did really well. At the end of the season, he was really getting the hang of it and at his last game he made 5 baskets! Shelby was a delight to watch. She was scared of the ball so she didn't go for it much BUT she always had the biggest smile on her face. All the time. So cute! Because I have been so busy with school, I decided to take the kids to Chuck E Cheese's after school this past week. I made Keaton ride this ride. Ha! I used to love a similar ride when I was young. You can see that he lost his front tooth!